At SMC, we understand that our impact is tied to our partnership with the projects and staff doing the work each day. Rose Kasumbi, Bethany Children’s Home Director, is no exception. Rose is a natural leader, and under her guidance, Bethany Children’s Home has made major strides. Her advocacy, focus on early childhood and staff development, and her constant optimism are just a few of the reasons we love working with Rose. Her path to becoming the Director of Bethany is nothing short of amazing. Rose Kasumbi, Director of Bethany Children's, Home with her family. Rose’s journey to Bethany Home began in 2003 when she and her family immigrated to South Africa from Kinshasa, Democratic Republic of the Congo. 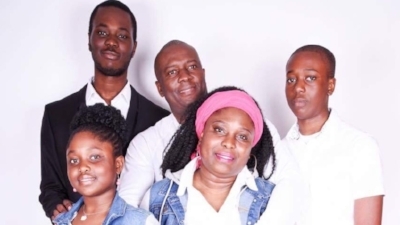 Amidst political strife that impacted their lives daily, Rose and her husband made the decision to immigrate in the hopes of raising their family in peace. Rose a nurse, and her husband a physician, chose to move to South Africa to provide new opportunity for their growing family. After time in Pretoria registering with the medical body of South Africa and a stent at a rural hospital in the Eastern Cape, Rose's husband accepted a position in Mthatha in 2006. It was shortly after their move to Mthatha that Rose and her husband welcomed their third child into their young family. With her husband’s advancing career as a physician, Rose continued to focus on their children, home life, and settling in to their new community. Rose with U.S. Ambassador Patrick Gaspard at Bethany Children's Home. In September of 2009, Rose was invited by a friend to visit Bethany Children's Home. Rose still describes her first day at Bethany with vivid detail. “It was just so impressive, so many children caught up in difficult situations but still so happy and full of energy and love.” It was at the end of this visit that the Director approached Rose offering her a position as a nurse. With her young family in mind, Rose first declined the staff position but soon after agreed to working four hours per day. In December 2013, after losing their director, Bethany’s board approached Rose hoping she would act as Interim. It is now Rose’s fourth year as Director of Bethany Children’s Home. During her tenure, Rose has provided leadership that has supported new and exciting development. She has implemented a wellness program focusing on nutrition and health, made early childhood education and development the cornerstone of Bethany, and has empowered and supported staff in furthering their education. Bethany is a place where each child has a brighter future because of Rose’s passion and leadership. When asked to describe Bethany's ongoing mission and being an SMC Partnering Project Rose summed it up beautifully. Rose, we couldn't agree more.